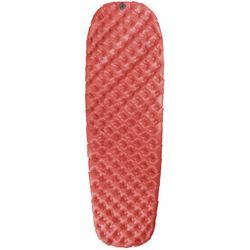 Sea to Summit Ultralight Insulated Sleeping Mat. Sometimes less is more: the Women’s Ultralight Insulated Air Sleeping Mat saves weight with its pared-down shoulder girth and shorter length compared to the unisex model. And sometimes more is more: it adds extra Thermolite® insulation to provide tested three-season warmth for women backpackers. IS THIS INSULATED AIR SLEEPING MAT…? Really comfortable despite being 2” thick? Yes. Thickness is not the key factor in an air sleeping mat; the number of points of suspension is. Your weight and contours rest on 174 individual air-filled springs (size Regular). Comfort & Support - 174 individual Air Sprung Cells™. These small interconnected chambers support your weight and conform to your body, similar to a spring mattress. Women's Specific Sleeping Mat Shape - Narrower in the shoulders, wider in the hips and knees. Offers greater comfort no matter what position you sleep in.